I have already spoken of the so-called "requisitioning" that took place among our people while I was working at Saffêd. This, of course, really amounted to wholesale pillage. 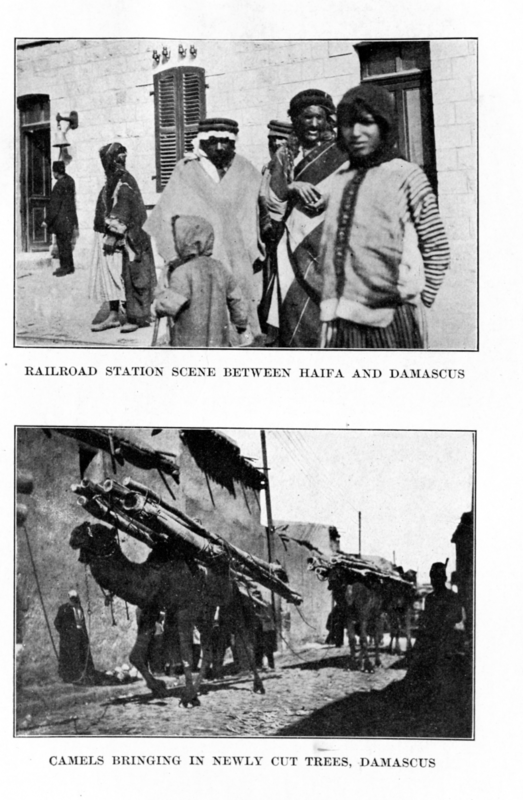 The hand of the Turkish looters had fallen particularly heavy on carts and draught animals. As the Arabs know little or nothing of carting, hauling, or the management of horses and mules, the Turks, simply enough, had "requisitioned" many of the owners--middle-aged or elderly men--and forced them to go south to help along with the tremendous preparations that were being made for the attack on Suez. Among these were a number of men from our village. In the course of time their families began to get the most harrowing messages from them. They were absolutely destitute, no wages being paid them by the Turks; their clothes were dropping off them in rags; many were sick. After much excited planning, it was decided to send another man and myself down south on a sort of relief expedition, with a substantial sum of money that had been raised with great difficulty by our people. Through the influence of my brother at the Agricultural Experiment Station, I got permission from the mouchtar to leave Zicron-Jacob, and about the middle of January, 1915, I set out for Jerusalem. To Western minds, the idea of the Holy City serving as a base for modern military operations must be full of incongruities. And, as a matter of fact, it was an amazing sight to see the streets packed with khaki-clad soldiers and hear the brooding silence of ancient walls shattered by the crash of steel-shod army boots. Here, for the first time, I saw the German officers--quantities of them. Strangely out of place they looked, with their pink-and-whiteness that no amount of hot sunshine could quite burn off. They wore the regular German officer's uniform, except that the Pickelhaube was replaced by a khaki sun-helmet. I was struck by the youthfulness of them; many were nothing but boys, and there were weak, dissolute faces in plenty--a fact that was later explained when I heard that Palestine had been the dumping-ground for young men of high family whose parents were anxious to have them as far removed as possible from the danger zone. Fast's Hotel was the great meeting-place in Jerusalem for these young bloods. Every evening thirty or forty would foregather there to drink and talk women and strategy. I well remember the evening when one of them--a slender young Prussian with no back to his head, braceleted and monocled--rose and announced, in the decisive tones that go with a certain stage of intoxication: "What we ought to do is to hand over the organization of this campaign to Thomas Cook & Sons!" However, the German officers were by no means all incompetents. They realized (I soon found out) that they had little hope of bringing a big army through the Egyptian desert and making a successful campaign there. Their object was to immobilize a great force of British troops around the Canal, to keep the Mohammedan population in Palestine impressed with Turkish power, and to stir up religious unrest among the natives in Egypt. It must be admitted that in the first two of these purposes they have been successful. The Turks were less far-sighted. They believed firmly that they were going to sweep the English off the face of the earth and enter Cairo in triumph, and preparations for the march on Suez went on with feverish enthusiasm. The ideas of the common soldiers on this subject were amusing. Some of them declared that the Canal was to be filled up by the sandbags which had been prepared in great quantities. Others held that thousands of camels would be kept without water for many days preceding the attack; then the thirsty animals, when released, would rush into the Canal in such numbers that the troops could march to victory over the packed masses of drowned bodies. The army operating against Suez numbered about one hundred and fifty thousand men. Of these about twenty thousand were Anatolian Turks--trained soldiers, splendid fighting material, as was shown by their resistance at the Dardanelles. The rest were Palestinian Arabs, and very inferior troops they were. The Arab as a soldier is at once stupid and cunning: fierce when victory is on his side, but unreliable when things go against him. In command of the expedition was the famous Djemal Pasha, a Young Turk general of tremendous energy, but possessing small ability to see beyond details to the big, broad concepts of strategy. Although a great friend of Enver Pasha, he looked with disfavor on the German officers and, in particular, on Bach Pasha, the German Governor of Jerusalem, with whom he had serious disagreements. This dislike of the Germans was reflected among the lesser Turkish officers. Many of these, after long years of service, found themselves subordinated to young foreigners, who, in addition to arbitrary promotion, received much higher salaries than the Turks. What is more, they were paid in clinking gold, whereas the Turks, when paid at all, got paper currency. Beersheba, a prosperous town of the ancient province of Idumea, was the southern base of operations for the advance on Suez. Some of our villagers had been sent to this district, and, in searching for them, I had the opportunity of seeing at least the taking-off place of the expedition. Beyond this point no Jew or Christian was allowed to pass, with the exception of the physicians, all of whom were non-Mohammedans who had been forced into the army. Beersheba was swarming with troops. They filled the town and overflowed on to the sands outside, where a great tent-city grew up. And everywhere that the Turkish soldiers went, disorganization and inefficiency followed them. From all over the country the finest camels had been "requisitioned" and sent down to Beersheba until, at the time I was there, thousands and thousands of them were collected in the neighborhood. Through the laziness and stupidity of the Turkish commissariat officers, which no amount of German efficiency could counteract, no adequate provision was made for feeding them, and incredible numbers succumbed to starvation and neglect. Their great carcasses dotted the sand in all directions; it was only the wonderful antiseptic power of the Eastern sun that held pestilence in check. The soldiers themselves suffered much hardship. The crowding in the tents was unspeakable; the water-supply was almost as inadequate as the medical service, which consisted chiefly of volunteer Red Crescent societies--among them a unit of twenty German nurses sent by the American College at Beirut. Medical supplies, such as they were, had been taken from the different mission hospitals and pharmacies of Palestine--these "requisitions" being made by officers who knew nothing of medical requirements and simply scooped together everything in sight. As a result, one of the army physicians told me that in Beersheba he had opened some medical chests consigned to him and found, to his horror, that they were full of microscopes and gynecological instruments--for the care of wounded soldiers in the desert! Visits of British aeroplanes to Beersheba were common occurrences. Long before the machine itself could be seen, its whanging, resonant hum would come floating out of the blazing sky, seemingly from everywhere at once. Soldiers rushed from their tents, squinting up into the heavens until the speck was discovered, swimming slowly through the air; then followed wholesale firing at an impossible range until the officers forbade it. True to the policy of avoiding all unnecessary harm to the natives, these British aviators never dropped bombs on the town, but--what was more dangerous from the Turkish point of view--they would unload packages of pamphlets, printed in Arabic, informing the natives that they were being deceived; that the Allies were their only true friends; that the Germans were merely making use of them to further their own schemes, etc. These cleverly worded little tracts came showering down out of the sky, and at first they were eagerly picked up. The Turkish commanders, however, soon announced that any one found carrying them would pay the death penalty. After that, when the little bundles dropped near them, the natives would, run as if from high explosive bombs. All things considered, it is wonderful that the Turkish demonstration against the Canal came as near to fulfillment as it did. Twenty thousand soldiers actually crossed the desert in six days on scant rations, and with them they took two big guns, which they dragged by hand when the mules dropped from thirst and exhaustion. They also carried pontoons to be used in crossing the Canal. Guns and pontoons are now at rest in the Museum at Cairo. Just what took place in the attack is known to very few. The English have not seen fit to make public the details, and there was little to be got from the demoralized soldiers who returned to Beersheba. Piece by piece, however, I gathered that the attacking party had come up to the Canal at dawn. Finding everything quiet, they set about getting across, and had even launched a pontoon, when the British, who were lying in wait, opened a terrific fire from the farther bank, backed by armored locomotives and aeroplanes. "It was as if the gates of Jehannum were opened and its fires turned loose upon us," one soldier told me. The Turks succeeded in getting their guns into action for a very short while. One of the men-of-war in the Canal was hit; several houses in Ismaïlia suffered damage; but the invaders were soon driven away in confusion, leaving perhaps two thousand prisoners in the hands of the English. If the latter had chosen to do so, they could have annihilated the Turkish forces then and there. The ticklish state of mind of the Mohammedan population in Egypt, however, has led them to adopt a policy of leniency and of keeping to the defensive, which subsequent developments have more than justified. It is characteristic of England's faculty for holding her colonies that batteries manned by Egyptians did the finest work in defense of the Canal. The reaction in Palestine after the defeat at Suez was tremendous. Just before the attack, Djemal Pasha had sent out a telegram announcing the overwhelming defeat of the British vanguard, which had caused wild enthusiasm. Another later telegram proclaimed that the Canal had been reached, British men-of-war sunk, the Englishmen routed--with a loss to the Turks of five men and two camels, "which were afterwards recovered." "But," added the telegram, "a terrible sand-storm having arisen, the glorious army takes it as the wish of Allah not to continue the attack, and has therefore withdrawn in triumph." These reports hoodwinked the ignorant natives for a little while, but when the stream of haggard soldiers, wounded and exhausted, began pouring back from the south, they guessed what had happened, and a fierce revulsion against the Germano-Turkish régime set in. A few weeks before the advance on Suez, I was in Jaffa, where the enthusiasm and excitement had been at fever-pitch. Parades and celebrations of all kinds in anticipation of the triumphal march into Egypt were taking place, and one day a camel, a dog, and a bull, decorated respectively with the flags of Russia, France, and England, were driven through the streets. The poor animals were horribly maltreated by the natives, who rained blows and flung filth upon them by way of giving concrete expression to their contempt for the Allies. Mr. Glazebrook, the American Consul at Jerusalem, happened to be with me in Jaffa that day; and never shall I forget the expression of pain and disgust on his face as he watched this melancholy little procession of scapegoats hurrying along the street. Now, however, all was changed. The Arabs, who take defeat badly, turned against the authorities who had got them into such trouble. Rumors circulated that Djemal Pasha had been bought by the English and that the defeat at Suez had been planned by him, and persons keeping an ear close to the ground began to hear mutterings of a general massacre of Germans. In fact, things came within an ace of a bloody outbreak. I knew some Germans in Jaffa and Haifa who firmly believed that it was all over with them. In the defeated army itself the Turkish officers gave vent to their hatred of the Germans. Three German officers were shot by their Turkish comrades during the retreat, and a fourth committed suicide. However, Djemal Pasha succeeded in keeping order by means of stern repressive methods and by the fear roused by his large body-guard of faithful Anatolians. We felt sure that the Turkish defeat would put a damper on the arrogance of the soldiery. But even the Mohammedan population were hoping that the Allies would push their victory and land troops in Syria and Palestine; for though they hated the infidel, they loved the Turk not at all, and the country was exhausted and the blockade of the Mediterranean by the Allies prevented the import and export of articles. The oranges were rotting on the trees because the annual Liverpool market was closed to Palestine, and other crops were in similar case. The country was short, too, of petroleum, sugar, rice, and other supplies, and even of matches. We had to go back to old customs and use flint and steel for fire, and we seldom used our lamps. Money was scarce, too, and, Turkey having declared a moratorium, cash was often unobtainable even by those who had money in the banks, and much distress ensued. As the defeated army was pouring in from the south, I decided to leave Beersheba and go home. The roads and the fields were covered with dead camels and horses and mules. Hundreds of soldiers were straggling in disorder, many of them on leave but many deserting. Soon after the defeat at the Canal several thousand soldiers deserted, but an amnesty was declared and they returned to their regiments. When I arrived at Jerusalem I found the city filled with soldiers. Djemal Pasha had just returned from the desert, and his quarters were guarded by a battery of two field guns. Nobody knew what to expect; some thought that the country would have a little more freedom now that the soldiery had lost its braggadocio, while others expected the lawlessness that attends disorganization. I went to see Consul Glazebrook. He is a true American, a Southerner, formerly a professor of theology at Princeton. He was most earnest and devoted in behalf of the American citizens that came under his care, rendering at Jerusalem the same sort of service that Ambassador Morgenthau has rendered at Constantinople. He was practically the only man who stood up for the poor, defenseless people of the city. He received me kindly, and I told him what I knew of conditions in the country, what I had heard among the Arabs, and of my own fears and apprehensions. He was visibly impressed and he advised me to see Captain Decker, of the U.S.S. Tennessee, who was then in Jaffa, promising to write himself to the captain of my proposed visit. I went to Jaffa the same day and after two days' delay succeeded in seeing Captain Decker, with the further help of Mr. Glazebrook, who took me with him. The police interfered and tried to keep me from going aboard the ship, but after long discussions I was permitted to take my place in the launch that the captain had sent for the consul. Captain Decker was interested in what I had to say, and at his request I dictated my story to his stenographer. What became of my report I do not know,--whether it was transmitted to the Department of State or whether Captain Decker communicated with Ambassador Morgenthau,--but at all events we soon began to see certain reforms inaugurated in parts of the country, and these reforms could have been effected only through pressure from Constantinople. The presence of the two American cruisers in the Mediterranean waters has without any doubt been instrumental in the saving of many lives.